George Tolman (compiler), Concord, Massachusetts Births, Marriages and Deaths, 1635-1850 (Concord, Mass. 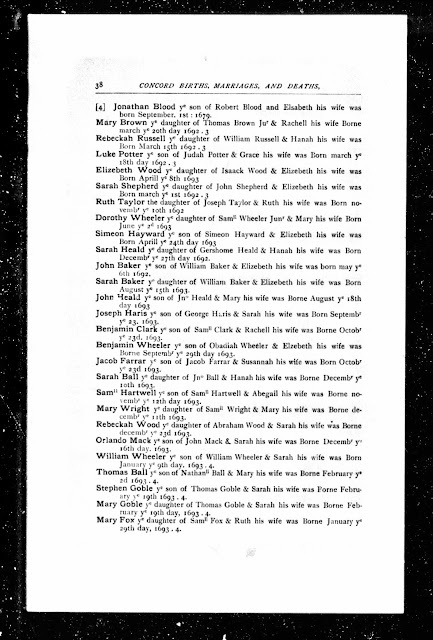 : Committee on Printing, 1894), page 38, Mary Goble birth entry, 1694. Mary was the second child and second daughter of Thomas and Sarah (Shepard) Goble. She was a twin with her brother Stephen. Mary Goble married John Fletcher (1692-????) on 10 May 1715 in Watertown, Massachusetts. They are my 6th great-grandparents. I am descended from their daughter, Abigail Fletcher (1720-1783) who married Samuel Whitney (1719-1782).